Why are great customer service employees so rare and valued? A great customer service representative is "one in a million." It takes a remarkable combination of skills, knowledge and instinct to become a customer service superstar. Now you have the opportunity to discover that combination and put it to work to achieve your own goals. You can get what it takes to be one of your organization's most valued assets — and be on your way to a stellar professional career. 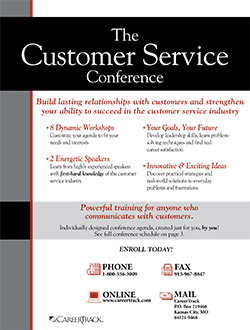 This noteworthy conference was designed to address the customer service issues, strategies and skills that can help you become "one in a million." In a practical workshop setting, you'll learn the secrets to solving the most difficult CS challenges, positioning yourself to attain success and satisfaction in one of today's toughest fields. Management skills for the CSR … learn the leadership skills that are essential to your success, no matter what your title is. Problem-solving techniques … learn to consistently produce satisfied customers. Turn tempers down and transform even the angriest people into repeat customers. Real career satisfaction … learn to really love what you do and keep the stress and frustration in check every single day. 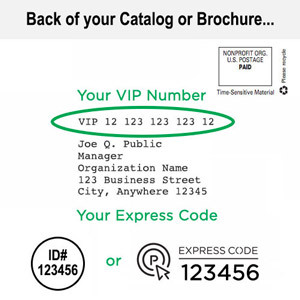 The unique two-track format of this conference allows you to customize your day for your particular needs and interests. Select from eight power-packed sessions and two high-interest tracks to refine your strongest skills or target your weaker areas. You decide how the conference can best meet your needs! This incredible event is a can't-miss opportunity! It's a chance for you to grow and learn from nationally-recognized speakers and workshop leaders, but most importantly, you'll focus on the specific issues you need to succeed, with a customized agenda designed just for you, by you. How can you stay focused today without losing sight of what's looming ahead? Take a look at where the field is headed and what it means to you. This is a frank, eye-opening discussion about the steps you need to take right now to position yourself — and your organization — for success in a rapidly changing world. Whether you're a manager today or eyeing future opportunities, learn and refine the key qualities that get CS managers noticed, lauded and rewarded. What do CS managers cite as their most pressing challenge and concern? Top talent — how to get and keep it in today's tight labor market. It's harder than ever to attract promising talent, and even harder to retain your top performers. You'll learn creative and aggressive tactics to find and hire the best people and foster a work environment that keeps them from "jumping ship." Few organizations deliver customer service strictly face-to-face or by phone. Communication channels such as email, voicemail, faxes, live chat and websites have become more commonplace, heightening convenience but posing a tricky challenge — how to use technology to its full potential, yet still maintain a personal and responsive tie to customers. Every staffer has a different idea of what constitutes a "good job." This session details ways to raise performance standards and motivate everyone to reach for superior levels of service. You'll learn how to identify key performance benchmarks and communicate your expectations to employees in a way that will make them strive to meet the highest standards! Do you really know what you're communicating? And what message, exactly, is your customer trying to get across? In face-to-face communication, words convey only 7% of the total message. The same holds true for the phone, where only 14% of the message is communicated by words! In this session, learn how to understand, control and use the full 100% of communication resources to your advantage. Rules of clarity: Most miscommunications occur because one or more of these rules are broken! You should welcome complaints! Why? Because most of your ex-customers didn't bother to complain. They simply took their business elsewhere. Every complaint is an opportunity to turn an unhappy customer into a satisfied one, while using the feedback to prevent future dissatisfaction. You'll learn how to use problem-solving techniques to regain the trust of customers and make them feel they've been treated fairly. Session 3: Taming Tempers: How to Win Over Angry, Demanding, Impossible Customers! Every CSR can tell you dozens of "war stories" about out-of-control, rude or furious customers. Even the best reps and organizations regularly face highly charged situations; it's a fact of life. The good news? With proper training, you can handle practically any bad situation that comes your way — coolly, calmly and with dignity! Session 4: Building Partnerships: Boost Cooperation with Customers, Coworkers — Anyone! Learn the process by which customers come to trust you and value the relationship! You'll discover the simple, yet highly-effective, techniques that build "partnerships" — putting you and your customers on an even footing, with common goals and problems. The techniques you'll learn apply to any relationship, so you'll boost trust and cooperation with coworkers, family members and friends as well!